We had a mixed bag of weather this past weekend. Saturday was rainy, cool, and muggy. Sunday morning and the early afternoon were a continuation of Saturday’s sucky weather, but then around 3 o’clock, the humidity broke, the clouds rolled away, and it turned into a spectacular late afternoon. Since Sudsy Sunday plans were underfoot, I thought I would get a jump on the festivities and try a Hefe Weizen that’s been in my fridge for the past couple weeks. Ever since my first Paulaner Hefe Weizen, I have been a huge fan of this beer style since they can be enjoyed on their own, or paired with a wide variety of foods. I have had them on numerous occasions with German food (Wurst Platters, Sauerbraten, Bavarian Pretzels, Rollmops, etc. ), and the results have always been superb. I first had the Ayinger Brau-Weisse Hefe Weizen on draught during my anniversary weekend in Manhattan with Mrs. G-LO. I liked it so much that I just had to pick up a bottle to see how it compares to the draught version. Taste: Really good carbonation. Lots of tiny bubbles that tingle your tongue. Clove spiciness carries through from start to finish. Crisp, clean, and slightly tart finish. 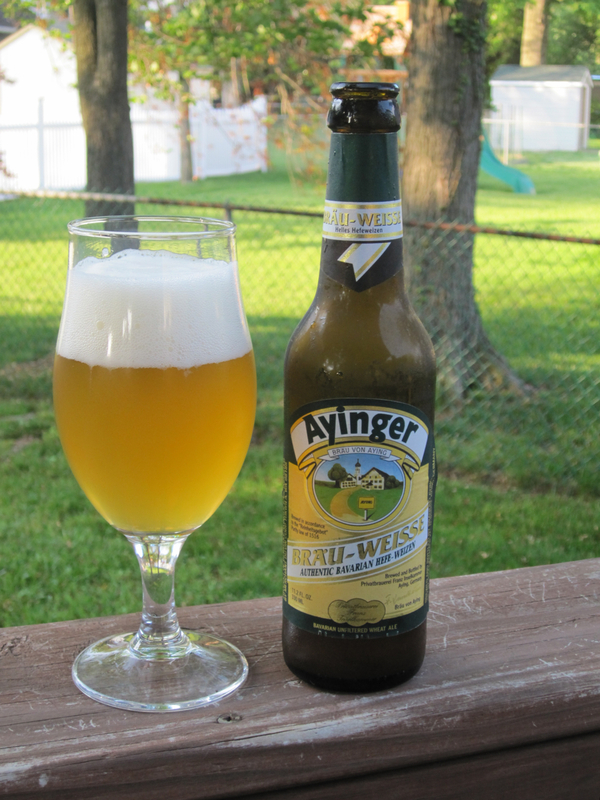 The Ayinger Brau-Weisse Hefe Weizen is a great example of this beer style. If I had to describe this beer, I would say that it lies somewhere between a Belgian Witbier (it has the lemon, but lacks the coriander) and a classic German Hefe Weizen (it has the clove, but lacks the banana). This is a highly drinkable, thirst quenching, and session worthy beer, and the bottled version is just as good as the draught version. I highly recommend the Ayinger Brau-Weisse Hefe Weizen, and if I could find it in cans, then it would be a serious contender in the upcoming Ultimate Summer Beer Challenge! Hey G-LO, I’d never heard of Ayinger until a few weeks ago, I had a marzen on tap. They’re the real deal when it comes to classic bavarian german beer. Even their website is in german – http://www.ayinger.de/?pid=262. I’ll add this one to my own summer line up. Another tasty review! Thanks Paula! I didn’t know about this one till dinner at an Austrian restaurant in Manhattan. The waitress recommended it. So good that I had to have it again. I’d be curious to try the Marzen or anything else they make. I was also happy that it didn’t disappoint in bottle form. Great stuff for sure. I picked up a bottle of this at Kress over the weekend and I have to concur with G-Lo this was a very drinkable, session worthy beer. I drink Hefe Weizen exclusively, this is my favorite of all with one exception, Edelweiss Hefetrub which I haven’t been able to find in years. Great review! Thanks for the comment AND the compliment Bill! I need to explore more Old World beers. You know… for educational purposes only! And, I’m right there with you. Education is just too important not to get actively involved.